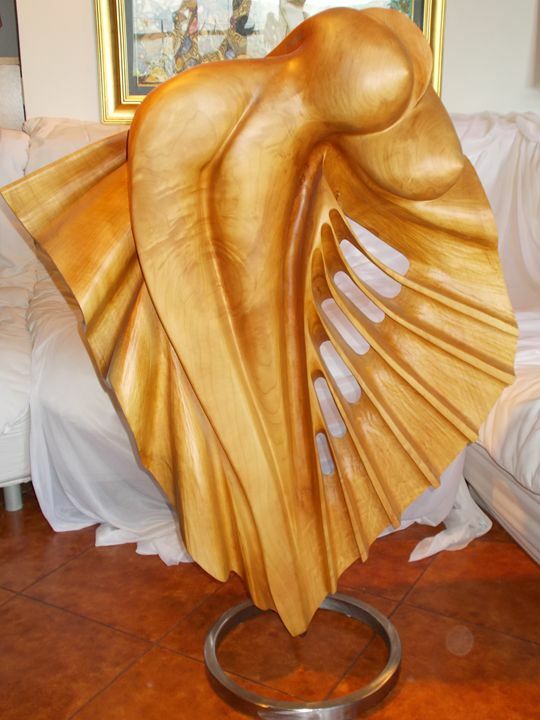 Sculpture made from willow tree wood, lacquered and with stainless stell base. 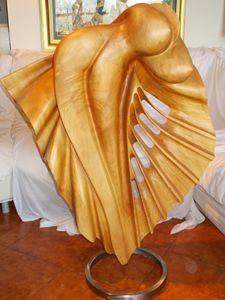 Sculptor PETER VENE is thoroughly occupied with creating images in wood. He has been searching for them in roots and forked branches that he found - he created images in linden wood blocks - and now he is searching for them in barks of willow trees and poplar. 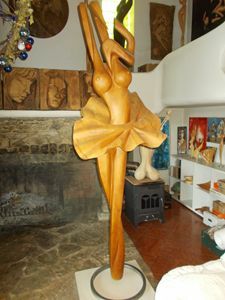 Peter possesses an outstanding sensitivity towards natural materials such as wood, stone and iron. He knows them like as if he lives with them. 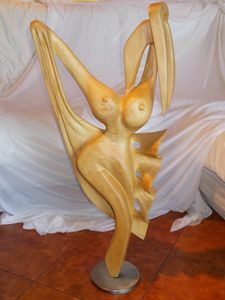 He feels, thinks and works with wood because he has learned 'Its logic', nature and characteristics which represents the essence of sculpturing as an art and skill. He picked out aged and excavated recluses of poplar and willow tree all over our country, which were damaged by the force of time and nature itself. He chopped them down and brought them to his place where he could pay closer attention to them. I saw that metamorphosis from the natural forma viva to sculptors impressive large pile of vivid forms, which means the first step of sizifs work in creation of this status. He has cleaned, has dug the soil out of them and has created amazing human images out of faceless, half turned to dust roots and other parts of trees. He has been discovering and stressing out forms which are similar to human features. Recently he has been working on organomorfic forms which live in all three dimensions.